We are a little church on Capitol Hill in Washington, DC, that is committed to continuing the work of Jesus: peacefully, simply, together. We are a Church of the Brethren congregation, a Historic Peace Church that values peacemaking, social justice, simple living, and following Jesus in community together around God’s Word. At Washington City Church of the Brethren, we have implemented a new ministry model that goes back to our early Brethren roots. We believe very strongly in the “Priesthood of all believers”—that is, that all believers are gifted and equipped to do ministry in the church. Certain people are called out for their gifts in teaching and leadership: these are our licensed and ordained ministers. Our church’s goal is to find meaningful ways for everyone to participate and serve, valuing all gifts and talents. 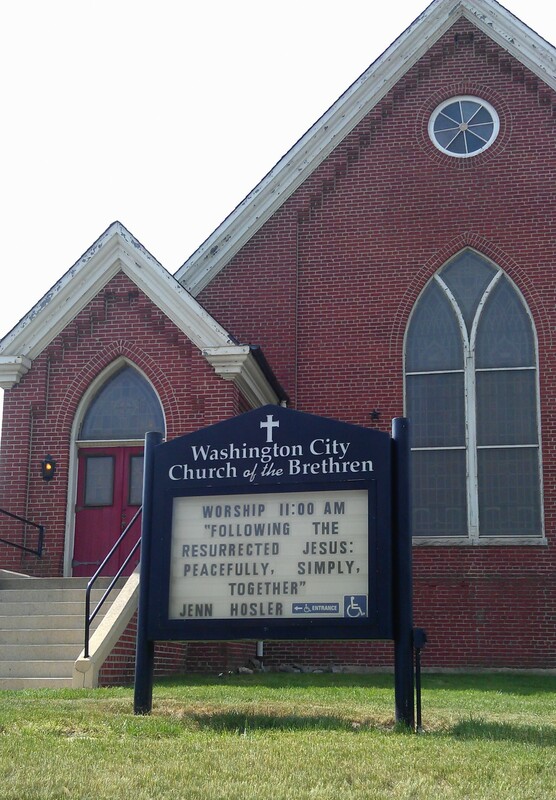 Our Team of Ministers at Washington City Church of the Brethren is made up of Jeff Davidson, Jennifer Hosler, and Nathan Hosler. They are all equally part-time ministers leading the congregation through preaching and through the sharing of other pastoral roles. Jeff serves as a minister at our congregation focusing on pastoral care and preaching. He also works as a call-taker and trainer at the 911 center in Fairfax County, VA. Jeff has been a radio broadcaster, a pastor, and a car salesman. His academic training is in communication (BS, Speech Communication and Drama) and congregational studies (MDiv.) Jeff enjoys reading old mystery stories, fantasy sports, Turner Classic Movies, and rooting for the Nationals. Jenn serves as a minister at our congregation, focusing on community outreach and preaching. She also works with others to coordinate worship planning and preaching. Jenn is a full-time PhD student in Community and Applied Social Psychology. She has previous training in Community Psychology (MA, Community Psychology and Social Change) and also in biblical and theological studies (BA, Biblical Language). She has served for the Church of the Brethren denomination in numerous capacities, including writing bible study curriculum on social justice in the prophets and is currently conducting a narrative research project on urban churches across the US. Jenn loves to run long distances, ride her bicycle, plant and tend her tiny urban farm, and spend her little free time with Nate, her kittens, and friends. Nate serves as a minister in our congregation, focusing on advocacy and preaching. For his employment, he coordinates the Office of Public Witness for the Church of the Brethren denomination. The office’s work is summed up in the tagline “seeking to live the peace of Jesus publicly.” Nathan has a BA in Biblical Language and and MA in International Relations. He is currently working on his PhD in Theological Ethics. Nate prefers to run long distances, have several books started at one time, and eat food from around the world. At Washington City Church of the Brethren, our sermons are based in Scripture and consider how we might live as Christ-followers in our world today. Because of the teachings of Jesus, we seek to be peacemakers in a violent world, to care for God’s creation, to live simply, and to work for justice. To read our sermons, click here or the tab above. This community rain barrel provides chlorine-free rain water to the community and prevents more than 50,000 gallons of storm water from carrying pollution directly to the Anacostia River. Please feel free to take as much as you like to irrigate your garden. Our church building functions as a meeting place for both the church and the community. We provide space for groups such as: The Hill Preschool, Church of the Brethren’s denominational Office of Public Witness, and other community and visiting groups as available. We are located at 337 North Carolina Avenue, SE, Washington, DC 20003.